Endive was a popular early Spring bitter green a hundred years ago. This divine tangy homemade French vinaigrette dressing served on crisp endive greens creates a flavorful, nutrient-rich salad. Even though I found this recipe in a hundred-year-old cook book, it probably was considered a tad old-fashioned in 1916. Cooks a hundred years ago worried that tossed salad greens looked disorganized, and sought to impose order to salads using scientific salad making techniques that, for example, embedded ingredients in gelatin. Thank goodness strange food trends get reoriented over time. In 2016, this old recipe seems amazingly modern–and Endive Salad would be perfect with grilled salmon, chicken, or other dishes. Wash the endive and pat dry with paper towels, then tear the endive into bit-sized pieces and put into a large bowl. Set aside. To prepare the dressing: In a small bowl, combine the mustard, salt, paprika, red pepper, onion, olive oil, and vinegar. Pour the dressing over the torn endive and gently toss. Refrigerate for at least one hour, then drain off any excess dressing and place the marinated endive in a serving bowl. Garnish with chopped chives. 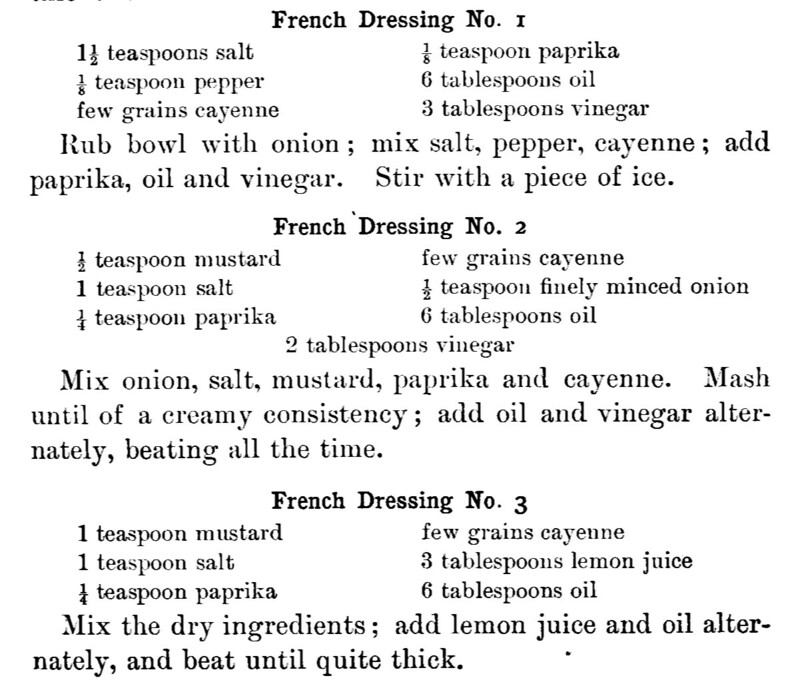 French Dressing apparently was very popular a hundred years ago. Lowney’s Cook Book, a cookbook published in in 1912, had three French Dressing Recipes – none of which are anything like the cloying bright orange bottled dressing that’s in all the supermarkets today. I made French Dressing, Number 2. In my opinion, the original recipe was too salty, so when I updated the recipe, I only used half as much salt as was called for in the old recipe. Posted on May 1, 2016 April 30, 2016 by SherylPosted in FoodTagged endive, recipe, salad. Isn’t that interesting the scientific orderly making of salads! I’ve never eaten Endive that I am aware of. But this sounds nice. Endive is a crisp green with a pleasant, slight bitterness. I think that you’d like it. I might just pick some up at the grocers this week. I guess back then creativity wasn’t as highly valued in homemakers as professionality! There is nothing better than a simple salad and your little piece on the interpretation of how salads were viewed back then was fascinating. Fancy things like a simple salad having history attached! Food history is fascinating. It’s really intriguing how foods vary in popularity (and in how they are presented) across the years. Migration, periods of scarcity and abundance, the invention of new ingredients and dishes, all affect what we eat. I love the touch of the chives! So do I. The chives are a perfect seasonal food addition to this recipe. Scientific salad-making techniques? Yikes! I’m glad we got that out of our systems. The French dressing looks like something my kids would like (two out of three love mustard and cayenne pepper). I think that they’d like it. This dressing is a very nice vinaigrette. It’s amazing that sickly sweet orange stuff is today’s French dressing. These recipes sound so much better, thanks! I’m very curious how the type of dressing called “French Dressing” managed to change so much over the course of the past hundred years. 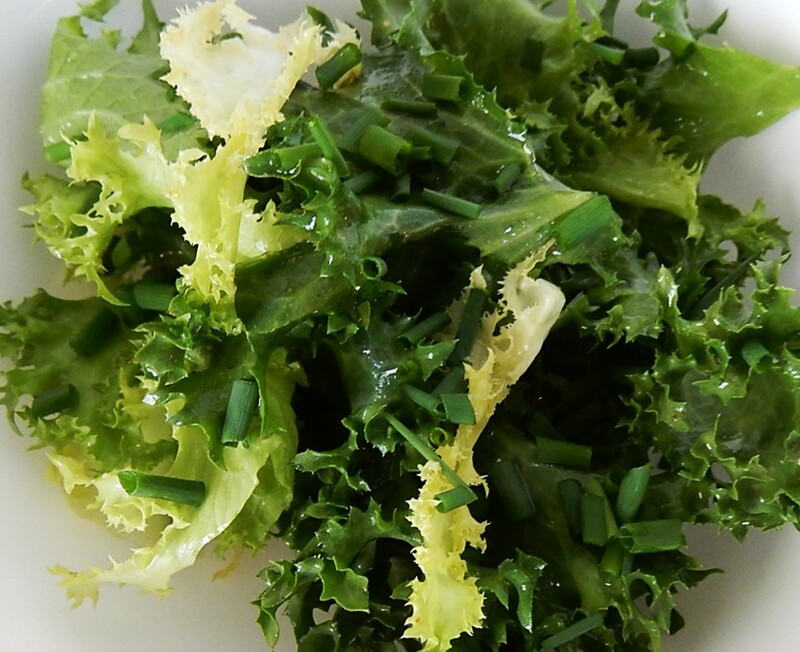 So many wonderful greens exist for making salads . . . hard to believe that I grew up on iceberg lettuce — but that is what we knew at that time. I take a salad to work nearly every day for lunch and am very happy to have some new options for quick and tasty dressings. Thank you. It’s wonderful that such a wide variety of tasty, nutritious greens are now readily available. I never made a salad with just endive, I always mixed it with fresh baby spinach, and spring garden lettuce. The French dressing has definitely change from 100 hundred years ago.. I think now it would call for ketchup. This sounds good! Endive is a little more bitter than spinach and lettuce, but I like it alone in a salad. I think that you’re right that a modern recipe for French dressing would call for ketchup. I can’t figure out why it has changed so much across the years. You’d think that when they started making a new dressing with ketchup that they’d just give it a different name, rather than appropriating the name of a another dressing. It’s very easy to make. I think that you’d like it. I’m fine with many dishes that contain gelatin, but not with fresh salads. That doesn’t make any sense to me. My grandmother went to college for Home Ec in the 1920s and she was very into composed salads. I remember always being wary of her salads as a child–odd thing like cottage cheese and walnuts in Jello, etc. . . .
To go to the soda fountain and get a cherry Coke was the highlight of any trip to town. Cherry Coke salad was made cherry jello (of course! ), with cherries and pecans, and you actually put a bottle of Coca Cola in it, hence “Cherry Coke.” The Coke gave it an amazing taste. I still have my recipe for it in my old handwritten copies of family recipes. This is new to me, but it does sound like the Cherry Coke Salad had a really fun taste. I can see why you liked it. I love that terminology: “composed” salads. A salad taxonomist! What a thought. Of course, they transformed home-making into home economics, too, so there’s that. I’ve never really enjoyed endive, but I’d be willing to give it another go mixed with other greens, just to try this dressing. When I read “French dressing,” of course I thought of that orange stuff, which is pretty ghastly. But it occurred to me to take a look at Brianna’s French dressing, and what I found seems to be much like your recipe. I use the brand’s buttermilk and cheddar-chipotle dressings, and love them. Maybe I’ll try your recipe and some of the Brianna’s, and see if the company really has achieved the taste of a true French. At the same time, those home economists were the feminists of their day. They were trying to make women’s work as scientifically organized as the work men did. (Remember this is the era when time and motion studies were regularly conducted to ensure that factory workers didn’t slack off on the job.) Everything gets so complicated. . .
It’s really interesting that at least one company makes a more traditional French dressing. Oh, I couldn’t forget those time/motion/management studies. My dad was an industrial engineer for the Maytag Company, and that was what he did. It was a terrible position to be in, actually, because those guys constantly were being hassled by management to find new ways of being productive, even while they were hated by the guys on the line who felt like they were being pressured to produce more than was humanly possible. Interesting, for sure. Whew, that had to be a difficult job. I’ve always been really fascinated by those studies. What a lovely salad- it looks so simple to prepare too! Your posts continue to defy my stereotypes of eating 100 years ago! I’m glad that they sometimes surprise you. I find the early 1900’s to be an absolutely fascinating time period. I like homemade salad dressings. These all sound good! Not too much for endive though. These old salad dressing recipes would work perfectly with lettuce or other greens. Looks modern and delicious! I had to smile at the scientific techniques that would impose some order into salad making. It’s interesting how ideas about how salads (and other foods) should be presented have changed across the years. Endives are pretty common eaten over here in Belgium. We love it raw & stir fried or hot with a bechamel sauce. I love your tasty recipe a lot. Yum! mmm. . . Endive served hot with a bechamel sauce sounds lovely.